Please join us in welcoming our venerable Ayya Tathaaloka back to Fremont. Ayya Tathaaloka will be coming down from our Aranya Bodhi Forest Hermitage with Sayalay Santacari for a half-month stay at the Bodhi House from June 28th thru to 20th July. During her stay, Ayya Tathaaloka plans to visit places around the area recommended for our new monastery/vihara. Stay tuned for further news on this. Anumodana for all that you offer and share in whatever form. May you be well and happy, peaceful and at ease. May you not lack for the basic requisites of life. May you have all needed support in your practice of the Path. There is no trash service at the hermitage. Please be aware that all garbage and recycling that comes in will also need to be carried out. 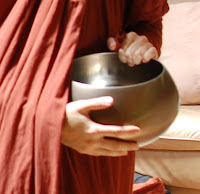 Thank you for your care of our monastic community, our human society and all living beings!